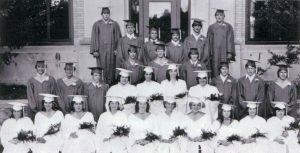 1st row: Cass Burtis, Rosemary Bessette, Ellie Porter, Kathleen Bullock, Cynthia Coloton, PAmela Rider, Marnie Hogle, Yvonne Sero, Ronda Augustus, Laurie Fountain. 2nd row: Brad LaPoint, John Thomas, Jimmy Powers, Laura Farr, Paul Colton, Dora Robinson, Darlene Fry, Donald Hale, Christopher Hull, Terry Brewer. 3rd row: Thomas Bassett, Gilbert Allen, Alan Sharlow. 4th row: Howard Given, Jon Smith, Dean Hale, Gary Loop, James Waugh, Robert Dixon.